"Whatever you do, don't call the wolves "mascots" while Saladin is around"
Shiro-4 is an Exo Guardian who resides at the Iron Temple. Apart from being a trusted ally of Cayde-6, he also runs scouting missions for the Vanguard. During the SIVA Crisis Shiro-4 helped Lord Saladin Forge and Cayde coordinate the campaign against the Fallen, providing vital intel to the Guardians on the field. Shiro-4 long served as a protégé to Cayde-6 before the latter's rise to the Vanguard post and was believed to have wielded the Trespasser Exotic sidearm. Free of the burden of leadership that ties his mentor to the Tower, Shiro willingly aids the Vanguard whenever his skills are requested. Tasked with tracking and eliminating Fallen threats, Shiro has traditionally spent most of his time making runs between Earth, Luna and Venus—gathering intel and engaging in hit-and-run attacks on active Fallen crews. Shiro's selflessness—combined with his talents for tracking, weapons-crafting, and combat—makes Shiro an invaluable extension of the Vanguard’s will beyond the City. When the House of Devils returned and rediscovered the nano-tech plague, SIVA, utilizing it to evolve themselves and corrupt the Plaguelands, Shiro worked alongside Lord Saladin to combat the mutated Fallen. Shiro assigned patrols and strikes against the Devil Splicers, such as destroying Sepiks Perfected, ending the Splicers' experiments on the Hive by killing Kovik, Splicer Priest and finally slaying the Splicer leader, Aksis, Archon Prime. Shiro also played a role in deciphering the puzzle in the SIVA server farm that led to the creation of the Exotic Pulse Rifle, Outbreak Prime. A year after the Red War, Cayde-6 dies in the hands of Uldren Sov. At some point during/after Cayde-6's funeral, Shiro-4's Ghost recounts the first time Cayde and his Ghost, Sundance, had met and started their friendship. "I feel bad for Cayde, stuck in the Tower… the fun's out here." "Let Tyra and the Cryptarchs decide what legends to write. Our job is giving them something to write about." "The fact the Devils were able to resurrect some form of Sepiks is… concerning." "You’ve done right by Saladin." "You did right by Saladin and the Iron Lords." "The Fallen getting their hands on SIVA tech isn’t something to take lightly." "If the Fallen have a name for you, I'm sure it's an insult. You should be proud." "Lord Saladin’s in a good mood." "The Splicers are augmented with SIVA, which means they understand that tech more than we do." "I wonder… how many Iron Temples are hidden out in the world?" "The Archon Prime is dead… but we’ve got a long way to go with our Fallen problem." "Great… the Fallen aren’t content with worshiping gods, now they want to become one." "New gods popping up every day… if everyone’s a god… is anyone?" "No… No… an Archon Prime… yeah, it’s a first for me too, but it’s dead so a first and hopefully last." "All due respect to Lord Saladin, but the SIVA threat is more than just lost honor." "Every time the Fallen put their faith in a machine, we send it to scrap." "These Splicers have fortified a entire section of the Cosmo’s outer wall… they’re protecting something." "Understanding your enemy takes patience and time." "I can’t imagine having to face the Iron Lords like that… brave isn’t even the right word." "We cannot let up or the Fallen will overrun the Cosmodrome for good." "The problem with machine gods is they can always be rebuilt. We’ve gotta stay alert." "A new Iron Lord walks among us." "When you can protect the City while preserving a hero's legacy. Well, I call that a good day." "You’ve got one helluva track record, Guardian." "These Fallen aren’t going to back down anytime soon." "If the Splicers can use SIVA to create false gods… imagine what a good gunsmith could do with it." "The Fallen aren’t giving up the Cosmodrome without a fight." "We’ve gotta redirect our focus… really hit the Fallen to keep them in check." "The more Fallen we drop, the better off we’ll all be." "Every mile I’ve walked… still amazed how much we don’t know." "Saladin seems solemn, but there’s a new fire burning in him." "How well do you know the Cosmodrome?" "I don’t mind solitude, but every now and then it’s good to be part of a team." "SIVA’s Golden Age tech. My glimmer's on we’re underestimating just how powerful it is… which is saying something." "The Fallen getting their hands on SIVA isn’t something we can ignore." "Tyra knows how we got here. If Saladin doesn’t wanna open up, she will." "Even after the Complex, the Splicer situation is bad and it’s getting worse." "Everything we do out here we do to protect the City." “Archivist isn’t a job description, it’s who and what she is at her core. She consumes history so she can understand it and share it." "You killed a Prime, but his Splicer crews are still on the prowl." "I'd pat you on the back for taking out the Splicers' new Prime, but this fight is far from over." "I’m here when you need me." "Well, I knew you were good… but Iron Lord? That’s impressive." "Stay alert, come back safe." "Cayde was right about you… good fighter. Always ready for the next round." "The Iron Lords' crest fits you well." "To the trail's end sister/brother." "The newest Iron Lord graces us with her/his light." "Don’t get too cocky out there." "You’ve faced down a siege engine and a Splicer's Prime… well done Lady/Lord Guardian." "You need anything, I’m here." "Your Light is needed here." "Is there a god you can't defeat?" "Guardian! Cayde speaks highly of you." "Welcome back Lady/Lord Guardian. I never doubted you." "Always good to see another Hunter. No wonder the Vanguard have their eye on you." "You know, scholars and explorers have a lot in common"
"Is the Lady/Lord Guardian ready to rough up some more Splicers? Or does she/he need a few minutes to catch her/his breath?" "Hunter! The trails we seek are simply lost and must be found." "Hey, hey! You with me? Lets get to it." "Guardian! We have a war to fight." "Hope you’re ready to hunt Fallen, Guardian." Shiro-4's cloak appears to be made of House Banners belonging to the Fallen House of Kings, and he wears Exotic chest armor Lucky Raspberry. It can be inferred that Shiro-4's use of the Lucky Raspberry indicates that he is a Bladedancer. Shiro-4's personal weapon is the Exotic sidearm Trespasser, which he kitbashed together himself. Despite being a student to Cayde-6, Shiro-4 is much more serious in most situations. Shiro only makes a couple of sarcastic quips and remarks during relaxed situations, unlike Cayde who is overtly wise-cracking in nearly all missions. In Destiny 2, Shiro-4 is mentioned only by name in the Tower Hangar by Cayde-6 post game. 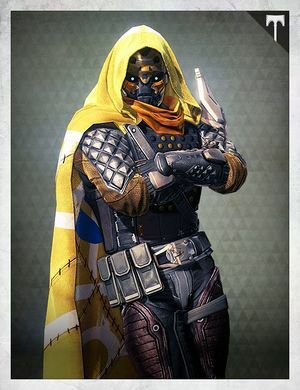 In Destiny 2 Forsaken lore tabs, its revealed that Shiro-4 was once a member of the 'crew' run by Cayde and Andal Brask, prior to the latter becoming the Hunter Vanguard(s).